Hello fans! It’s El Bolso once again with all the latest on Uruguayan soccer. The South American U20 Championships kicked off this past week, while Nacional began their preparation for the Clausura tournament and the Libertadores playoff with some friendlies. Let’s get right to it! The CONMEBOL Under-20 Youth Championship, hosted by Uruguay, is in full swing already. In Group A, favorite Argentina has been busy, beating Ecuador 5-2 in their first match and Peru 6-2 this past Sunday. In between, however, they faced a strong defensive team in Paraguay and could not find the net, losing 1-0. They’ve shown they can beat up on the weaker teams, but even another lopsided win against Bolivia won’t do much to show that they’ll be able to hold their own in the final round, where the quality of play will get better. It’s not every day that your opponents scores 2 own goals and gifts another 2 on bad defensive passes, as Peru did. Still, after 3 of 5 rounds, it looks like it will be Argentina, Paraguay, and potentially Peru moving on. But really, all we care about is Group B, right? On Thursday, Brazil kicked off the festivities by sneaking past Chile 2-1. In the second game, Uruguay faced off against Colombia, always a tough opponent. The Lil’ Celestes did a good job of disarming the Colombian attack but struggled to create chances, and were imprecise or unlucky when they found them. All in all it was a hard-fought, mediocre game that was destined to end in a scoreless tie until Mauro Arambarri appeared in added time to steal the three points for Uruguay. A corner kick into the heart of the penalty box was intercepted by sub Rodrigo Amaral (the youngest Celeste at just 17 years of age and one of two Nacional players on the team), who headed the ball towards the far post; Arambarri flew in behind his marker and stuck his noggin right in front of the goalie, slamming the ball home. I can’t overestimate how huge this play was; instead of settling for a tie, the Uruguayans matched Brazil as group leaders and went into their second match (coincidentally against the Brazilians) with margin for error. Here are the match highlights. On Saturday, Chile beat Venezuela 2-0 to stay in contention, and then it was time for the big match: Uruguay – Brazil. To be honest, I didn’t see much to write home about in this Brazilian squad; they’re typically tough on defense (some may say dirty), but they lack offensive firepower (or else the Uruguayan defense is that good). This is not exactly a surprise, as the quality of Brazilian youth teams has been declining for a while now. It used to be that opponents were afraid of being embarrassed; now they’re just concerned about leaving the pitch in one piece. As I told Jobu during this game, the dirty secret about Brazil is that they wow you with the Jogo Bonito, but they win titles by cleating you in the intestines. Well, there wasn’t much beautiful game on display last Saturday, just a lot of hard tackles, aided by the traditional blind eye from the match referees. Uruguay, on the other hand, played a disciplined game, matching the Brazilians’ physicality while putting together some decent plays (led by Nacional first team starter and Charrúa Report regular Gastón Pereiro). In the 28th minute, Franco Acosta executed a free kick and placed the ball right in front of a streaking Pereiro, who headed it in from 6 yards out for the opening score. Nothing changed until the 59th minute, when another Acosta free kick made its way through the crowded box to the far post, where Arambarri (who else?) was waiting to head it in for the match’s final score (match highlights here). Two games, three goals, all from dead balls, all headers; it’s not an amazing performance, but it’s good for 6 points and a virtual lock on a final round spot for the Celestes. Uruguay will next face Chile on Wednesday and finish with Venezuela on Friday. As for the rest of the group, Brazil beat Venezuela 2-0 on Monday and figure to move on; Colombia got a huge 3-0 win against Chile and are also looking good. Chile and Venezuela will need help to avoid elimination. Meanwhile, it’s time once again for the summer break friendly tournaments, which feature the top Uruguayan teams plus some decent competition from across South America. You can’t read much into these games, as the local teams usually return from vacation just days earlier and haven’t really had time to implement their training program, but there’s always bragging rights to claim. 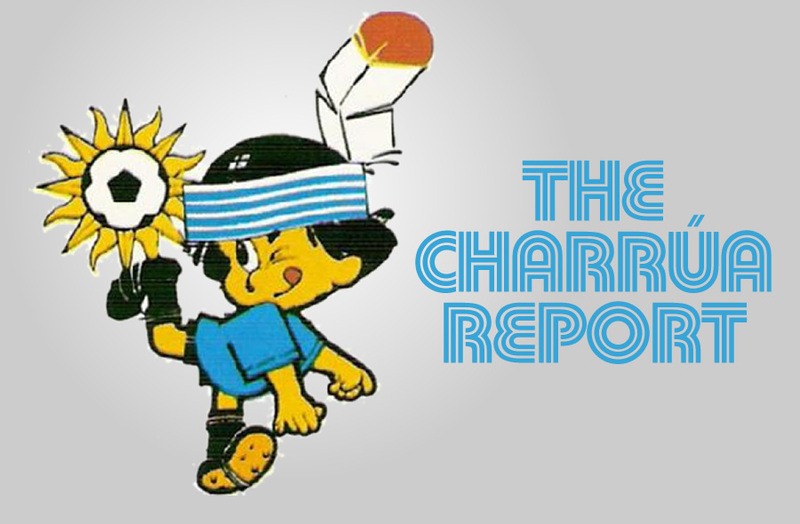 The tournaments themselves vary from year to year, as sponsors join in or drop out, but there’s usually 1 or 2 involving Nacional and Peñarol, and an additional one that invites Defensor and Danubio plus the hot team du jour. The teams generally look rusty (especially when a coaching change has just happened), and there’s the occasional scrap between fans, but usually nothing of consequence happens, although it was a fight during one of these games last year that started the whole Nacho–Mama house arrest fiasco that El Bolso reported on earlier in the season. 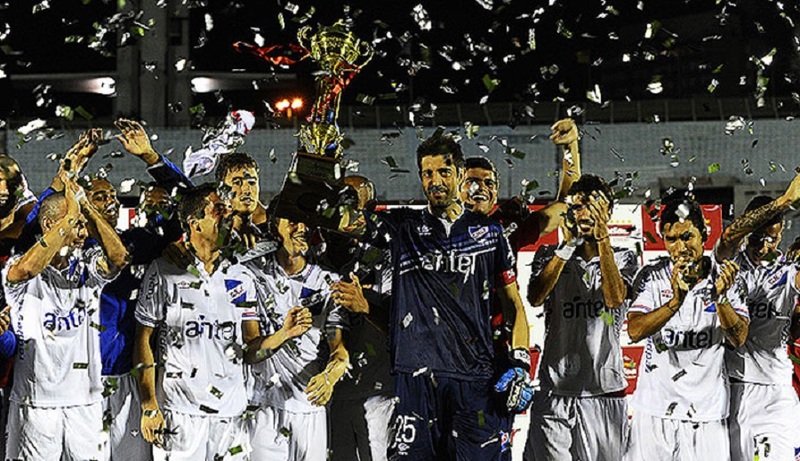 The first event on the Calendar this year was the Copa Suat, which featured the aforementioned Defensor and Danubio (really the whole point of this tournament is to keep these two from complaining about not being invited to the other friendlies), Apertura shocker Racing, and special guest Atlético Rafaela from Argentina’s top division. The semifinals featured a scoreless tie in the “Little Derby” (see, it’s this kind of thing that makes those two so insecure), won by Defensor in penalty kicks, and a 1-0 win by Racing. The final was interesting because of coach Marcelo Larriera, who led Racing to an unprecedented second place in the Apertura and promptly abandoned shop to take over… at Defensor. Racing, which lost their wunderkind coach but is still making headlines, got the last laugh in this one, winning 1-0. There was a third place match in there as well, but honestly who gives a crap? The real fun started on Monday the 12th, with the Copa Bandes (if you’re wondering about the weird names, they’re named after the main sponsors). The first semifinal featured Universitario, one of Peru’s traditional powers, facing River Plate of Argentina, fresh from a Copa Sudamericana title. I was expecting River to pull through, but Universitario moved on thanks to a goal by the redundantly named Germán Alemanno. In the nightcap, Peñarol tried to get off to a good start under new coach Pablo Bengoechea, while Nacional looked to not have anyone hurt or put in jail. Playing mostly with subs and reserve team players, Nacional took advantage of a magnificent header by Carlos De Pena to dig the knife a little bit deeper in Peñarol’s wound. The final was played two days later, and Nacional sent Universitario home with no trophies, beating them 2-1 on goals from Santiago Romero and Gonzalo Ramos, a talented offensive midfielder who is nevertheless still slumming it in the reserve team at 23 years of age. With Pereiro off with the Lil’ Celestes, these tournaments may be Ramos’s last chance to show he belongs with the big boys, and it looks like he means to make the most of the opportunity. Also, I think he looks a little like Landon Donovan, which is what I referred to him as during my commentary about the game with Jobu. Next on the agenda was the Copa de Verano (Summer Cup). It used to be called Copa Antel (Antel is the Uruguayan state telephony concern), but after the mass brawl that happened last year I guess the organizers felt they needed a change. This one started this past Monday with another Uruguayan derby, plus a game between two Paraguayan teams, Nacional (because originality) and Sportivo Luqueño. First up it was the other-guayans: after a 1-1 tie, Sportivo booked a spot in the final in a penalty shootout. Then it was Nacional and Peñarol, this time with a few more regulars taking the field for the Tricolores and the Fightin’ Argentino, Pablo Migliore, back in goal for the Manyas. Once again, Nacional was (of course) the winner, this time by a 3-0 score that does not do justice to how close this game was. It took only 5 minutes for the Tricolores to go ahead, as Ramos (I told you he was motivated) slotted home a Migliore rebound. That’s how the first half ended, with Nacional protecting the lead (and their players’ legs) and Peñarol showing very little. In the second half, however, Bengoechea’s team took control of the game and came close to tying it, but a couple of brilliant saves by Gustavo Munúa kept the Tricolores in front. Unfortunately for Peñarol, they lost a little bit of steam when the referee had to stop the game for about 5 minutes to deal with a gaggle of Manya fans that were killing time behind Nacional’s goal by throwing chunks of concrete at Munúa (stay classy, Peñarol). With 15 minutes to go, a quick Nacional counter led to a great feed by All-World corner kicker and Peñarol beater Alvaro “El Chino” Recoba and a 1-on-1 between Migliore and Apertura top scorer Iván Alonso (I told you Nacional brought out some of the heavy artillery for this one). The keeper was able to save Alonso’s shot but again gave a rebound, which bounced to the top of the box, right to Sebastián Fernández. “Papelito” (Little Paper) one-timed a volley towards the net, which defender Joe Bizera stopped by smacking at it with his hand. That’s a penalty kick and an automatic red card, even in a preseason friendly. Recoba took the kick, making it 2-0 for the good guys. With 5 minutes left in the game, Romero finished off another counter with a nifty finish right in front of Migliore (who by this point looked ready to fight everybody again), and the rout was on. The angry Carbonero fans took to sending cement flying Munúa’s way again, and the referee ended the game with a couple of minutes to go amid vehement protests from the entire Peñarol team. Oh, I’m sorry guys, were you planning to suddenly become the Seattle Seahawks for those last few minutes? Of course you were. Why don’t you leave the poor referee alone and go yell at your own ignorant fans? Anyway, Nacional is scheduled to face Sportivo this coming Wednesday in the final, while in the third place game Peñarol must once again face a Nacional team; they must think they’ve died and gone to their own special circle of hell. And as far as Nacional goes, again, you can’t put a lot of weight in these games, but Alvaro Gutiérrez just keeps on winning (that’s 20 wins in 21 games since taking over as coach). We’ll see how the rest of the preseason plays out, but until that first Libertadores game in Chile against Palestino, it won’t really matter. Hey, you know what’s back this week? Pasion Tricolor! I have three shots of it for you: the first derby, the win against Universitario, and this week’s Manya shellacking. Enjoy! I’ll leave you with Arambarri’s goal against Colombia which will hopefully pave the way to glory for the Lil’ Celestes. See you next week!